Plymouth University Peninsula Schools of Medicine and Dentistry is the first in the South West to invest in the ‘cutting edge’ technology of a virtual dissection table, which will be used to teach anatomy to medical, dental and physician associate students. There are currently only 16 of such tables in use in medical schools across the UK, with the nearest in London and Birmingham. The Anatomage Table is the most technologically advanced anatomy virtual dissection and visualisation system for anatomy education. The technology works like a large tablet pre-programmed with male and female subjects taken from a combination of the Korean Visible Human collection and Computed-Tomography (CT) data sets from real people. Data sets include detailed anatomy of specific organs and areas of the body, and a vast library of digital pathological examples. 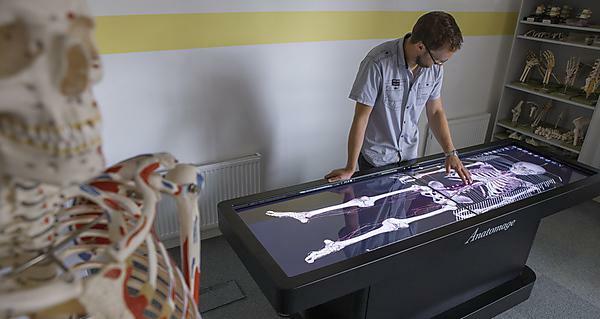 The Anatomage Table is the latest in a range of state-of-the-art technology used to teach anatomy at Plymouth University. The innovative medical curriculum was designed so students experience anatomy as they would in real life clinical encounters, from the outside in of a living patient, rather than a cadaver. The anatomy course uses a combination of volunteer model patients, surface anatomy, medical imaging, plastic and computer-animated models to ensure students have a thorough understanding of the 3D nature of anatomy, normal variation and pathology across individuals. All biomedical sciences teaching, including anatomy, follows the life cycle. With each of the first two years starting with conception and ending with old age. This allows subjects to be revisited in greater detail each subsequent year: rather than cramming all anatomy into the early years of study as is traditionally done. Dr Siobhan Moyes is Lead in Anatomy and Tissue Pathology at Plymouth University Peninsula Schools of Medicine and Dentistry.